Hear ye, hear ye! The Peripatetic Players now have their very own website: peripateticplayers.org! Please visit, and subscribe to the blog there for all the latest news. Or, sign up for our email list — it’ll get you all the most important announcements. And there’s lots of news! That’s right… inspired by their command performance at the Bull Valley Roadhouse in November 2015, Samuel Peaches longs to reprise his starring role in Romeo & Juliet… but Thumper has ideas about a different star-crossed story — one with more droids. Mayhem is likely to ensue. 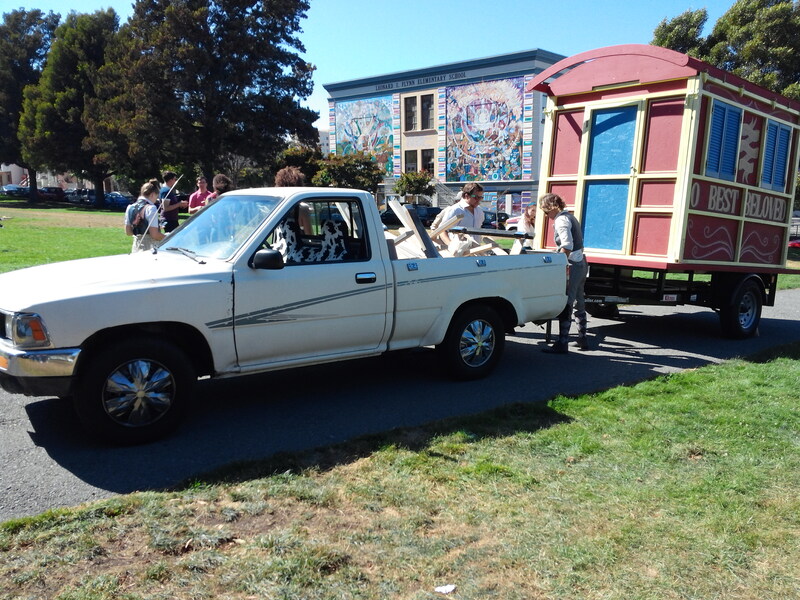 Coming Sept 10-24 aboard FluxWagon to a Bay Area park or public space near you. Follow the links for all the best info! Big love to Sam Bertken for the Shakespeare & Vader portraits. In the Continuing Adventures of the Peripatetic Players: SHAKESPEARE! Click to read all about the Player’s latest adventure, a short & sweet, one-night-only engagement at the Bull Valley Roadhouse in Port Costa, CA. With more photos, too! The Players are at work on creating a new website featuring all of their antics in one spot. Meanwhile, please be sure to Like Us On Facebook or Join Our Mailing List to stay up-to-date. The alleyway stage created by the Bull Valley Roadhouse for a Samuel Peaches’s Peripatetic Players performance of Romeo & Juliet on November 8, 2015. Particularly pleasant performances in Precita Park and Pleasanton! Wow, it’s like a magic box! That is so cool! Audience member in Pleasanton on August 17, watching FluxWagon fold up. 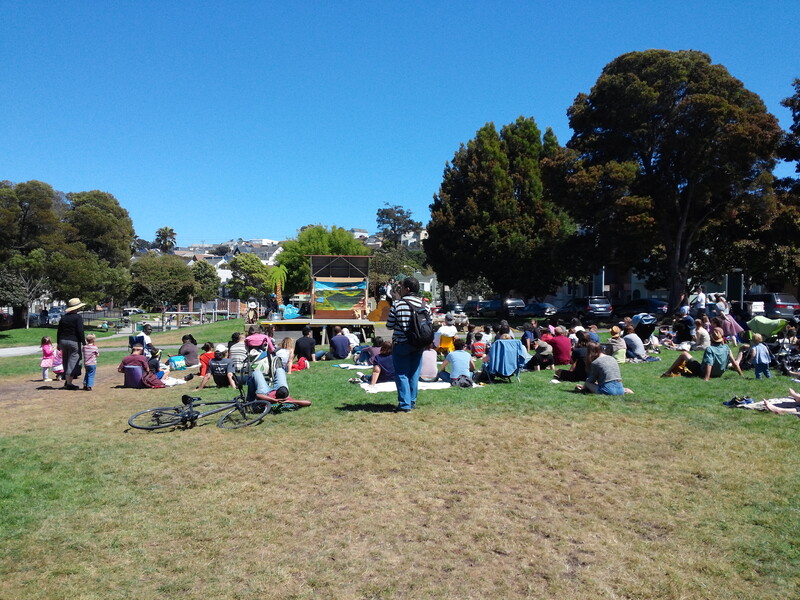 Samuel Peaches’ Peripatetic Players had two spectacular shows this weekend, full of sunshine and lively audiences! The players told tales of the High and Far-Off Times to over 200 people this weekend from Precita Park to Pleasanton. We’re thrilled to announce that we’ll bring O Best Beloved to Port Costa, CA on Saturday, August 23 at 1:00pm at the corner of Erskine Street and Canyon Lake Drive. Mark your calendars! Picnic lunches will be available for sale from the Bull Valley Roadhouse, who have created a special picnic menu for us. Pre-order lunch online starting July 28 or purchase at the show while supplies last. Picnic options include Muffaletta Sandwiches on focaccia (veggie or meaty), Fried Chicken Sandwiches with spicy aioli (there’s also a kids’ version without the spice), and sides like Fruit Salad, Cole Slaw or Potato Salad. Delish! Drinks including fresh lemonade, Mexican Coke, and beer and wine will be for sale at the show. And while you can purchase lunch last-minute at the show, we do recommend pre-ordering online. Our performance in Port Costa is going to be super special! Not only is August 23 the birthday of our own Marlene Yarosh, but you’ll not want to miss the chance to explore this sweet little town. 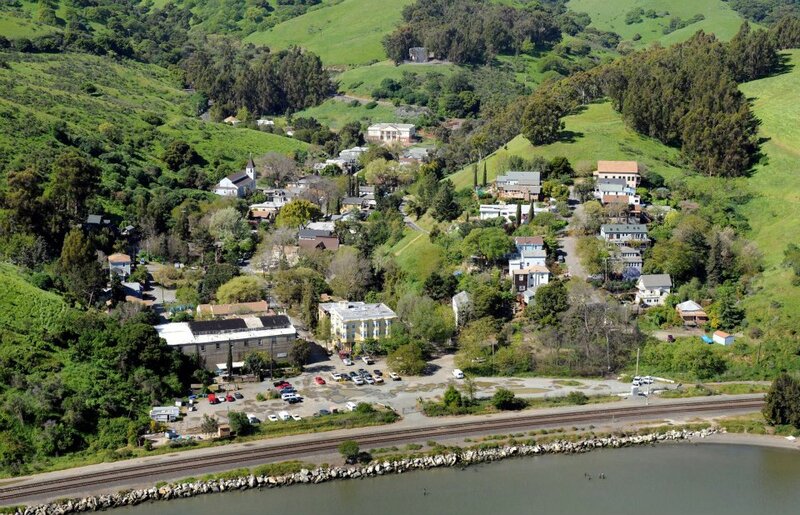 Once a busy wheat-shipping port, Port Costa is now home to about 200 people, a great dive bar with a phenomenal beer list, a fabulous Victorian-era hotel, the delicious Bull Valley Roadhouse, and Wendy Addison’s whimsical Theatre of Dreams. 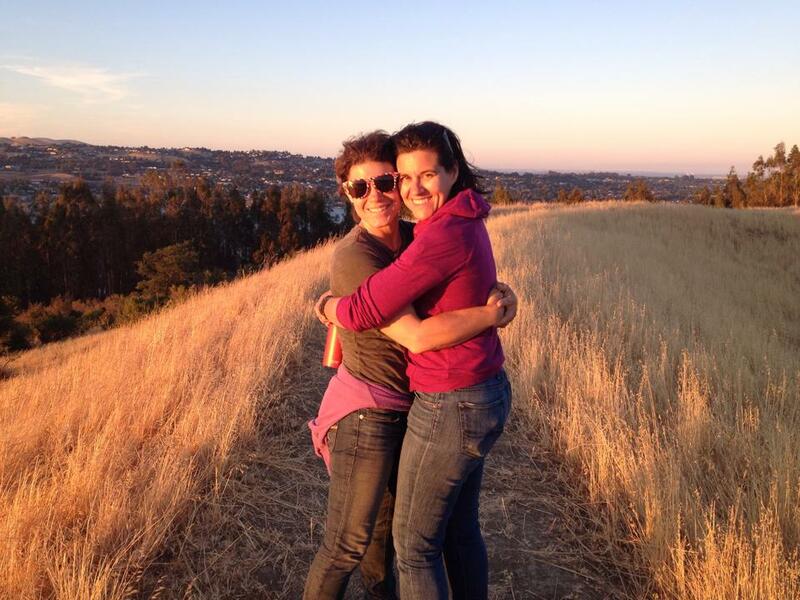 Here’s a photo of Joan & Rebecca in the hills above Port Costa this past July 4, when we went hiking with Marlene & Soren before checking out the fireworks above the Carquinez Strait. So where is Port Costa? Just a 40-minute drive from San Francisco, and just a hop and a skip from other spots in the East Bay. Find it on our Summer Tour map! Were Kipling to have visited Port Costa, perhaps there’d be a Just-So Story about this guy, immortalized at the Warehouse Cafe. Want to make it a weekend adventure? We highly recommend a hike after the show, staying overnight at The Burlington Hotel, and brunching Sunday morning at the Bull Valley Roadhouse. Perfection! Many thanks are due to Soren and Marlene, as well as the Port Costa locals who have welcomed us with open arms and helped make this performance happen — Dee, Jeff, Veronica & Tuala — thank you! For a full listing of our confirmed summer 2014 performances, check out our Tour Schedule. And for more info on seeing a show, please read our F.A.Q.